By Wes O’Donnell, Managing Editor, InMilitary.com & InCyberDefense.com. Veteran, U.S. Army & U.S. Air Force. Featured image courtesy Universal Pictures. Used with permission. Let’s get the controversy out of the way up front. Academy award-winning director Damien Chazelle’s film on the life of Neil Armstrong was met with outrage before it was initially released in theaters in October 2018. Many were upset that Chazelle chose not to show Neil Armstrong and Buzz Aldrin planting the American flag on the surface of the moon during the Apollo 11 mission. Conservative leaders and writers assumed that it was some vast left-wing Hollywood conspiracy. It is interesting that Rubio chose the word “Lunacy.” It was once thought that sleeping in moonlight made one crazy or a lunatic. Hence the word “lunatic” derives from the Latin word lunaticus or moon sick. But here’s the thing… First Man is one of the most patriotic movies that I have seen in a good long time. And this is coming from a U.S. military veteran with 10 years of service and a native Texan. If those who were quick to be outraged had actually seen the film first before taking to their outrage outlet of choice, they would have realized that the entire 141-minute film is one long symbol of American grit and determination. And spoiler alert, you do see the American flag planted on the moon in the film. As a student and amateur scholar of NASA’s Apollo program, I strain to admit that I learned something new while watching First Man. Namely, that Armstrong himself was a troubled and reluctant hero. I had always known that he was extremely humble, but a heartbreaking scene near the beginning of the film sets the stage for the emotional conflict that will follow Armstrong into the Astronaut Corps and beyond. It’s this trauma coupled with the inherent dangers of NASA’s Gemini and Apollo programs that put a severe strain on Armstrong’s marriage. Despite this, Neil Armstrong remained just as humble after his historic landing as he was before. Some historians argue that this humility, his exemplary performance as an engineer and pilot notwithstanding, is why leaders at NASA chose Armstrong to command Apollo 11. Ultimately, First Man is a psychological thriller about mourning, wrapped up in what was perhaps the single greatest human achievement in recorded history. And director Damien Chazelle, hot from his success with La La Land, shows that he is a master of both human drama and the technical cinematic wizardry needed to portray some of NASA’s greatest achievements. The only weak point, in an otherwise perfect film, is lead star Ryan Gosling’s performance of Neil Armstrong. You would be forgiven if you thought that Gosling was reprising his role as a replicant (android) from Blade Runner 2049; such was the constant look of indifference on his expressionless face throughout much of First Man. In real life, mission control recorded Armstrong’s heart rate spiking to 150 BPM at several key points during the Apollo 11 mission. I wish Ryan Gosling had communicated at least some of that anxiety in his portrayal. I can understand the challenges involved with acting in a biopic, however, I think Gosling could have spent more time making the role his own, rather than strive for a perfect recreation of a young Neil Armstrong. Courtesy Universal Pictures. Used with permission. The scenes that involve space travel are breathtaking in the most literal sense. You will find yourself holding your breath as the massive Saturn V rocket lifts off from the Launch Complex 39 site at the Kennedy Space Center. Even seemingly minor details of 1960’s America are painstakingly recreated to Damien Chazelle’s exacting standards. The movie nails the look and feel of mid-century Americana complete with authentic broadcasts of Kennedy speaking at Rice University in his well-known “We choose to go to the Moon” speech. Composer Justin Hurwitz deserves special mention for creating a score that compliments the on-screen drama perfectly. His 5 minute 32-second orchestral piece, called “The Landing”, as Armstrong and Aldrin are piloting the Lunar Lander to the Moon’s surface, is one of the tensest and striking pieces of music in the entire film. Both Neil Armstrong’s epic journey and director Damien Chazelle’s film about that journey, are accomplishments in their own ways. Based on the book by the same name by Professor James R. Hansen and produced by Steven Spielberg, First Man should be mandatory viewing for any and all students of space science. The ability to watch a historically accurate film that simultaneously takes the viewer to such an indescribable low, followed by a euphoric high, with the ever-present danger of sensory overload throughout, is not to be missed. 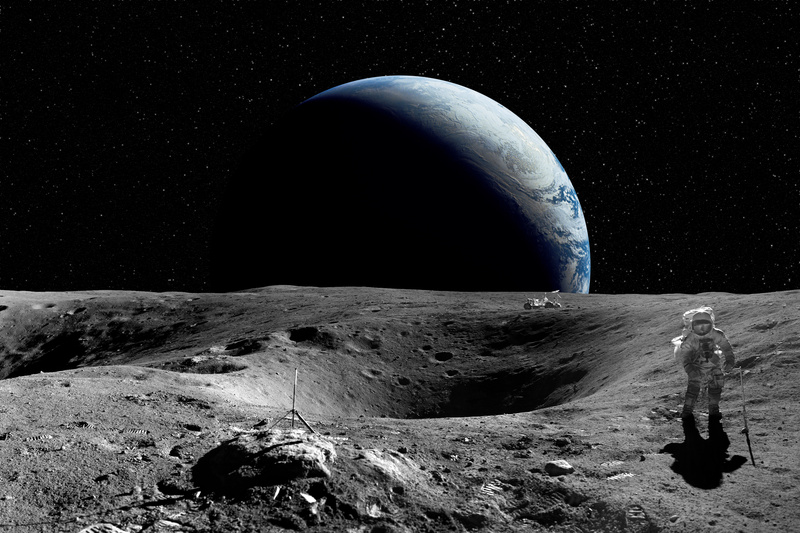 The fact that humans have walked on the moon should, even 50 years later, fill all of us with awe. Don’t miss your chance to watch this amazing film and be reminded of a time when the United States was an exemplar of discovery. First Man is available on Digital and via the digital movie app MOVIES ANYWHERE on January 8, 2019, and on 4K Ultra HD, Blu-ray™, DVD and On Demand on January 22, 2019, from Universal Pictures Home Entertainment. This article appeared originally on InSpaceNews.com.